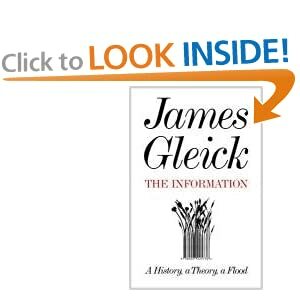 Popular science writer James Gleick recently published a book titled simply, The Information. Perhaps you’ve seen it? Maybe even read it, all 526 pages worth? I haven’t. But, I *was* instantly aware of it when it was published in March 2011 through book reviews like this one by Geoffrey Nunberg in The New York Times: http://www.nytimes.com/2011/03/20/books/review/book-review-the-information-by-james-gleick.html. (You might notice that the review published March 18 in print is concluded by a correction added April 3 on the website: “A review on March 20 about The Information, James Gleick’s history of data organization, misstated the surname of the founder of cybernetics. He was Norbert Wiener, not Weiner.”) I, however, read it on paper, complete with the error. Meanwhile, I caught glancing references to The Information in other magazines, on the radio, through websites, in conversation. The book’s subject matter, so far as I gleaned from these secondary sources, is information theory and includes the essentially-related subtopics of entropy, publication, computer networks, semantic chains, bits, encoding, and communication at large. Its constellation of references includes Ada Lovelace, Alan Turing’s universal computer, Kurt Gödel, Claude Shannon, Bell Labs, Norbert Wiener, cybernetics, MIT, logical recursion, and so on and so on. All of this seemed way too close to my own interests; I was almost afraid to read it. (I’ve no idea if you can relate to this impulse, but I was worried that my thinking might be spoiled by reading someone else’s synthesis of this material.) It was as if a more accomplished thinker and writer had opened the most active corners of my brain, mined the pertinent subjects, and ghosted it into a comprehensive and cohesive commercially available non-fiction hardback. on a trip, curl up with it in bed. One friend in particular was becoming increasingly emphatic, insisting I must read the book now. In June, he scanned Chapter 14, “After the Flood (A Great Album of Babel),” made a PDF and emailed it to me. He suggested I read only this chapter now (it is around Wikipedia and the endgame of libraries in the face of the ultimate archive known as the internet), as a preview or trailer for the rest of the book. So I read it. How could I not after such an effort? It *was* fantastic and my anticipation for the whole book was further stoked by this recommendation. By August that year, my brother-in-law toted the brick-of-a-book up on vacation to Vermont because he thought I’d enjoy it. Well, yes, I probably would, but not yet. So I *still* didn’t buy the book. I did however take my iPhone to the iBookstore (flipping the magic bookshelf at the center of the iBooks app) to track down a copy, or anyway see what was possible. The book was there and available for instant download at $15.99. A sample section of the first 155 pages was also there to be had for free. Free trumps $16 and besides, that would give me an excuse to hold onto my own thoughts on the book’s subjects rather than finding and replacing with the more carefully and rigorously arranged ideas of the author. I downloaded the e-pub and flipped through it, still assuming I would read the entire corpus on paper. That e-snippet sits still largely unread on my soon-to-be-obsolete (didn’t Apple release a new one yesterday?) iPhone stored in the electrical impulses (0 or 1) of its silicon memory as so much raw information — a total of 128,000 bits worth of the stuff. But what’s a bit? A bit is the standard unit of information as proposed by Bell Labs engineer Claude Shannon in his epoch-framing paper “A Mathematical Theory of Communication,” published in 1948. Shannon describes an abstract model of a communication system that applies widely outside of the narrow confines of his specific research as a telephone engineer. Shannon’s insights led directly to much of the information revolution and its attendant technologies. As soon as information could be quantified, measured and relayed in consistently measured chunks as bits, then it no longer mattered what kind of information was being relayed, what it meant, or to whom. Information was freed from meaning and now became a thing, as real as water and at least as fluid. Information was carried in the words on the pages of a book, by a secret whispered in confidence, through the electric currents of telegraph wires, and most consequently via electrical charges pulsing through the silicon valleys of a computer chip. Meanwhile (and finally), I stumbled online onto a podcast hosted by The Free Library of Philadelphia. The podcast records an evening with The Information’s author, James Gleick hosted at the Library on March 1, 2011, the night the book was officially published. “Andy,” director of author relations for the Free Library, awkwardly introduces Gleick who then proceeds to read the book’s prologue. This podcast is a pretty curious document — posted online as a downloadable mp3, documenting a live event where the author reads from his book published that same day and then answers questions from the audience. Not to make too much of all this, but it seems to me that this mp3 begins to describe the piecemeal ecology that is publishing (in its myriad formats and protocols) right now. I’d like you, if you will, to stop reading now and to listen to this recording. Pay attention to both *what* Gleick is saying but also *how* what he is saying is finding you, now. It’s about 30 minutes: http://libwww.freelibrary.org/podcast/media/20110301-jamesgl.mp3 . Just now, I ordered the hardcover copy of The Information. It should arrive tomorrow and I can’t wait to read it. But of course I already have been reading it, BIT BY BIT, through the multiple simultaneous channels that you’ve patiently just listened to me describe. It’s almost as if The Information’s information has pantomimed its subject matter by dividing and dispersing itself through the massively parallel networks of publishing and publicity, partially reassembling itself at the other end, in me — a reader, a victim, a willing accomplice. Maybe I’ll even get to read it.